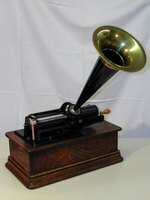 The phonograph is fitted with a spring motor that must be wound up with a crank handle before being played. A switch is used to start the drive for the cylinder drum and the spindle guide. A sapphire needle reads the grooves in the cylinder and transmits the sound waves by means of a lever to a membrane in the reproducer. From the reproducer, the vibrations are transmitted directly to the horn, where they are amplified. Playing time is two or four minutes depending on the type of cylinder.